Whether you are looking for a romantic getaway or a family reunion, the UK is full of cottages that make for the perfect place to gather. The wide choice available makes it easy to find a place to suit most budgets so here are a few options that might tick all the boxes you need. At the 1450 Barn in Devon, your children will not be bored. On the 200 acres of property there is an organic farm, Shetland ponies, goats and during March and April you can even see lambs. This barn has wooden beams, beautiful stonework and can sleep up to 6 people with 3 bedrooms and 2 baths. There is a relaxing hot tub and a local fishing area nearby as well. You may not be spending too much time here though as one night will set you back £480. Named after Cliff Barnes from the 1980’s hit series Dallas, Cliff Barns in Norfolk is unique and beautiful place to relax. This cottage describes itself as a “Cowboy-come-theme boutique retreat”. High wooden ceilings are complemented by slate floors covered with Aztec rugs with comfortable furniture to relax in. It is also a great place for groups to bond as it sleeps between 18-20, has 8 bedrooms, a hot tub and most importantly, a barbeque. For £990 per night this might be a reasonable price if there is a big group. If you are looking for a place near the water, Cruggleton Lodge in Dumfries & Galloway is a great option. This Georgian Lodge was restored and rests on a cliff top overlooking the Irish Sea. Cozy up next to the wood burning fire in the sitting room or relax in the wood fired hot tub. There are 2 chic bedrooms and a sofa bed making room for 4-6 people and costs £580 per week during off season. What better way to escape with your loved one than going to a romantic cottage in Cornwall. 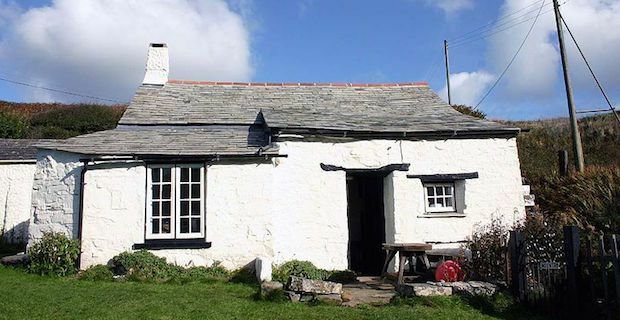 The Cottage in Charlestown lies near the World Heritage Historic Harbour of Cornwall Port. This place sleeps 2, starts at £130 per night and has a beautiful garden and courtyard to enjoy. During peak season you need to book for a minimum of a week but during off season the minimum book is only 3 nights.